Rob Austin beat Sabine Schmitz's time from a 2005 Top Gear Episode. "I could do that time in a van" – famous words from the 'Queen of the 'Ring' Sabine Schmitz during her first appearance on Top Gear back in 2004. Why did she say that? Well, Jeremy Clarkson was tasked with lapping the Nürburgring Nordschleife in under 10 minutes – he did so, setting a time of 9 minutes, 59 seconds. Fast vans? How about green vans? Now the British Touring Car Championship's Rob Austin has gone to the Green Hell and set a new unofficial lap record by beating Clarkson's time... in a van! The HMS Racing driver took to the 'Ring in a Volkswagen Transporter and set a time of 9 minutes 58 seconds. 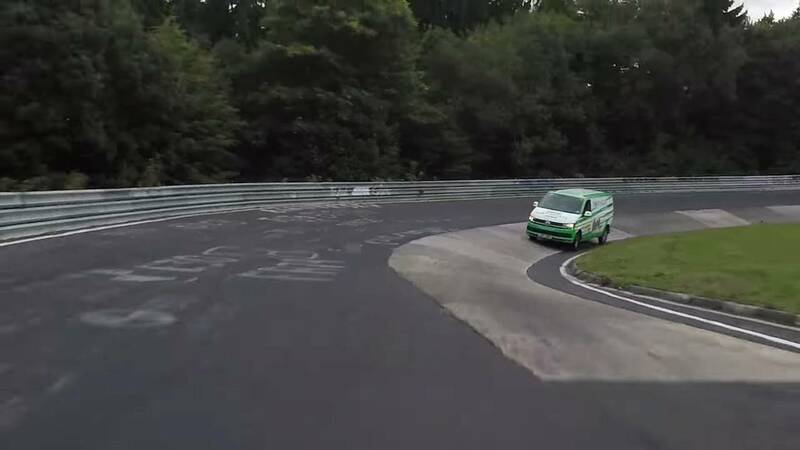 The previous van benchmark was in fact set by Schmitz, who attempted to fulfil her promise by returning to the track in a Ford Transit in 2005. Despite claiming she could crack the 10 minute barrier back then, she ultimately came up short, recording a time of 10 minutes and 8 seconds. 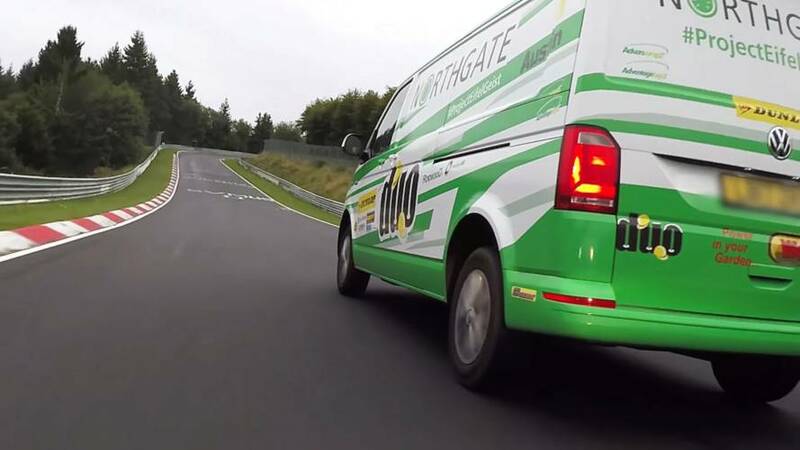 Austin's production-spec Volkswagen Transporter – powered by the mid-range 148 bhp diesel engine – was supplied by one of HMS racing's sponsors, Northgate Vehicle Hire, which is the UK's largest van rental company. The record was filmed for the short video (above) which chronicles two days of testing and record attempts for Austin as he set out to beat the 10-minute benchmark and the time set by Schmitz on the same track 13 years ago. 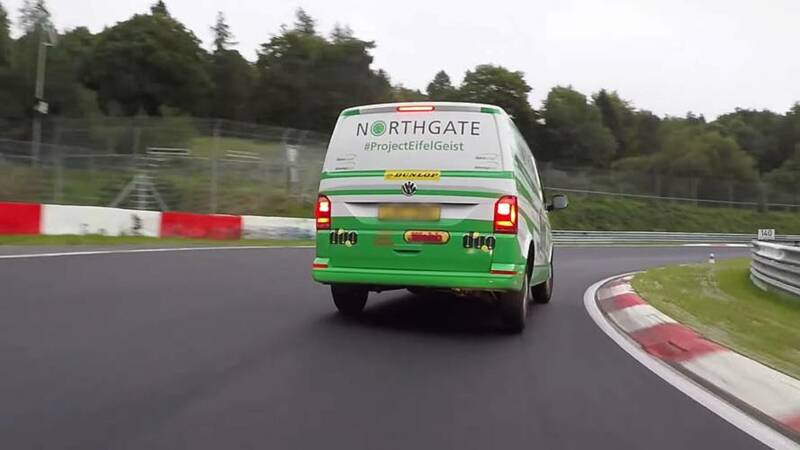 "This feat by a professional racing driver was an unusual way to showcase the quality and durability of one of our most popular vans, the Volkswagen Transporter," a Northgate Vehicle Hire spokesman said. "At Northgate, we believe a spirit of partnership is key to success, and we work tirelessly to ensure our customers have the right van to power their business. We’re proud to work with Volkswagen Commercial Vehicles, and offer its products to help meet the needs of our customers." Kate Wright, National Rental Manager, Volkswagen Commercial Vehicles, added: "The Transporter has won a host of accolades throughout its history, but this is perhaps one of the most unusual." "We’re really excited to be part of this record attempt which shows just what our vans can do," she said. "Most customers choose them because they’re reliable, cost-effective and offer some of the best technologies available, but maybe this is another good reason to choose one!"